The international mailing and shipping industry is growing significantly — global eCommerce topped $1.55 trillion in 2015, and is projected to grow another 162 percent by 2020. The [REDACTED] International Service Center (ISC) in [REDACTED] is one of five major facilities the U.S. Postal Service uses to receive inbound international mail. The Postal Service recorded inbound international mail volume of about 219 million pieces in fiscal year (FY) 2015, nearly [REDACTED] of which arrived at the [REDACTED] ISC. With limited exception, all inbound international mail is subject to inspection by U.S. Customs and Border Protection (CBP). [REDACTED][REDACTED][REDACTED][REDACTED][REDACTED][REDACTED][REDACTED][REDACTED][REDACTED][REDACTED][REDACTED][REDACTED][REDACTED][REDACTED][REDACTED][REDACTED][REDACTED][REDACTED][REDACTED]. The significant mail volume at the [REDACTED] ISC poses unique operational and technical challenges to the Postal Service and CBP. Specifically, CBP does [REDACTED][REDACTED][REDACTED][REDACTED][REDACTED][REDACTED][REDACTED][REDACTED]. 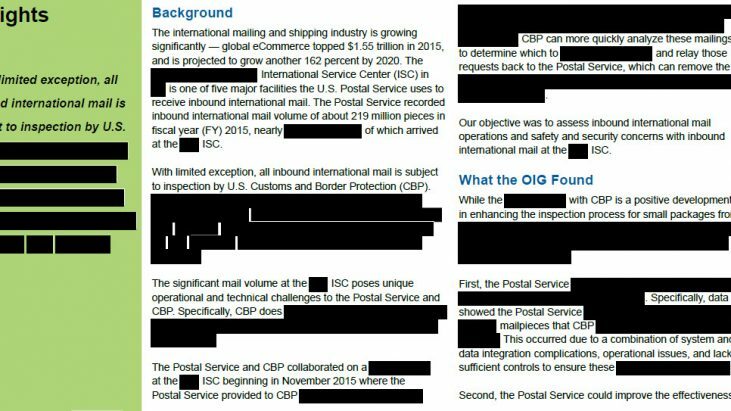 The Postal Service and CBP collaborated on a [REDACTED] at the [REDACTED] ISC beginning in November 2015 where the Postal Service provided to CBP [REDACTED][REDACTED][REDACTED][REDACTED][REDACTED][REDACTED][REDACTED]. CBP can more quickly analyze these mailings to determine which to [REDACTED][REDACTED][REDACTED]and relay those requests back to the Postal Service, which can remove the [REDACTED][REDACTED][REDACTED][REDACTED][REDACTED][REDACTED][REDACTED][REDACTED][REDACTED][REDACTED].